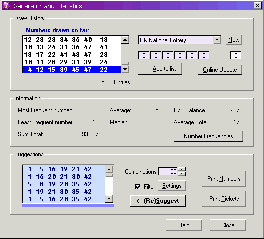 Lottery Assistant includes an advanced number generator, statistics, frequency graph, wheel system and lottery simulator. Also included are complete draw-number databases for the Florida Lotto, UK, SA & NZ national lotteries. Lottery Assistant can calculate number combinations from data for virtually any lottery system. Reads .CSV files (spreadsheet compatible). Print numbers directly to lottery tickets.